It’s shocking to see how many of the CalPERS investment committee are utterly ignorant. Aren’t these people supposed to know something? What’s the best defense against capture? A strong staff and informed trustees. The CalPERS video strongly suggests that CalPERS is lacking on both fronts. It is hard to overstate the vehemence of the reactions I’ve gotten to the video of the CalPERS’ last investment committee meeting. In the majority of cases, when I’ve asked for a mere quote, the respondents were so disturbed by what they saw that they penned commentary that ran to multiple pages. For instance, Andrew Stilton, who had stopped financial blogging months ago to pursue his art, felt compelled to come out of retirement to write not just one, but three posts on the Investment Committee meeting train wreck. CalPERS’ Investment Committee bears significant blame for the poor performance of CalPERS’ staff. Most CalPERS board members seem to regard their job as cheerleading and protecting CalPERS’ senior officers, rather than acting as vigilant protectors of CalPERS’ beneficiaries. This misguided sense of priories was evident when Investment Committee chairman Henry Jones repeatedly undermined fellow committee member JJ Jelincic’s questions. Jones acted as if Jelincic was putting the private equity team members on the spot, when competent industry professionals should have been able to field Jelincic’s questions easily. Similarly, other board members allowed staff to give misleading and incomplete answers. But even worse than the board’s lax attitude toward oversight is its lack of expertise. The presentation that led Jelincic to pose those not-difficult questions that nevertheless put the CalPERS officer responsible for private equity, Réal Desrochers, on tilt, was an insultingly basic primer on “carry fees,” which is the 20 in the prototypical “2 and 20” private equity fee scheme. The “20” stands for a 20% profit share once a preferred return, typically 8%, has been met. Stunningly, most of the Investment Committee members seemed pleased by the slideshow and acted as if they had learned something from it. In other words, the board is so utterly lacking in knowledge that it is incapable of providing adequate oversight, even if it were inclined to do more than governance theater. That means that staff operates with no meaningful supervision. The bumbling, evasiveness, and apparent lack of command of what should be basic material is exactly what you’d expect to see as a result of letting the inmates run the asylum. Vice Chairman Bill Slaton: What I’ve gleaned from this, and I’d like to just kind of make some comments at a higher level than where we’ve down in the weeds. It’s very clear to me that the terms and conditions of private equity deals vary by general partner and by vintage. There’s no set process. It’s a negotiation. 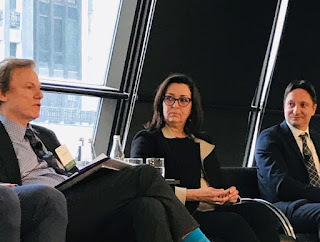 It’s also clear to me that there’s a large number of investors for GPs to choose from, that CalPERS is not the only investor out there, and so therefore, our ability to get the industry to change is something that I appreciate that we’re leading on, but we can’t control. But I think we’re making progress. It’s clear this is a largely unregulated industry that we’re trying now….that the United States is trying to do a better job regulating. And I’m glad that CalPERS is a participant in that. I read in the press terms like, you know, hide and cheat and steal. I think those are inappropriate terms. I think we have an industry that probably needs more regulation, but I — what I want us to focus on is to make sure that we are gleaning as much data as we can, and that we see the progress that’s attained, and we start to see the reports. I have faith in this group in front of us that you’re negotiating on behalf of CalPERS, as well as it can be done. So I’m not trying to….and I don’t think we should spend a lot more time trying to find where there’s an error or a problem. I think you all are on to this, that you’re working hard at it, and I think that there’s value in us better understanding what the range of possibilities are. So bring scenarios back to us and how it works, like you did here, is instructive for us. But I don’t think it’s productive for us to spend a lot of time trying to play gotcha. I was completely appalled to listen to Bill Slaton as apologist for the staff. It reminded me of the Public Relations Director of Wal-Mart in the documentary, “Is Wal-Mart Good for America?” The notion that the GPs can choose whom they want to, putting CalPERS in a defensive posture, is absurd. Let’s go through Slaton’s remarks in detail. I find these responses, which I am sure are sincere, simply incredible. Public pension funds make the single largest contribution to PE fundraising of any type of investor. Data provided by PitchBook show that public pension funds contributed between 15% and 25% of all funds raised by private equity in the years from 2000 to 2012. In 2013 public pension funds contributed 24.5% of all funds raised by private equity; and in 2014, 21.5%. One might reasonably expect pension funds to demand respect and deference from PE firms when the latter come, hat in hand, seeking capital for their private equity funds. Certainly CalPERS, which makes large investments in private equity year after year and whose lead is followed by many other pension funds should be sought after by GPs, not told by GPs – as is apparently the case – not to make demands because there are many investors for GPs to choose from. Slaton then notches his defense of private equity up a register and objects to the usage of words like “hide and cheat and steal” when applied to private equity. Perhaps he needs to read the press more extensively or acquaint himself with a dictionary. Private equity investors were upset when they leaned about fees like “termination of monitoring fees” of tens, sometimes hundreds of millions of dollars, via Gretchen Morgenson of the New York Times, particularly when they realized those fees were not shared with them in management fee offsets. They were similarly stunned to learn from Mark Maremont of the Wall Street Journal that KKR’s captive consulting firm KKR Capstone, was treated by KKR as being an independent contractor. That means KKR charged hundreds of millions of dollars of dollars for KKR Capstone services, when investors had assumed that was already covered by the management fee. If someone is taking a lot of money out of your investment and hasn’t told you about it, pray tell how is that not hiding? Similarly, how is it not cheating when KKR shifted nearly $20 million of broken deal expenses onto limited partners, when they should have been borne by co-investors that included KKR affiliates? The SEC deemed KKR’s conduct to be abusive enough to warrant $10 million in fines. And how is it not stealing when former SEC enforcement chief Andrew Bowden said of private equity general partners, “Investors’ pockets are being picked”? In other words, Slaton professes to support the effort to get tougher on the industry, as long as no one actually describes its bad conduct in simple, plain English terms. Perhaps he is concerned that the great unwashed public will wise up as to how general partners have fleeced limited partners like CalPERS for years, and the limited partners and overseers like him have done perilously little to prevent it . Like any large investor, CalPERS must systematically attack every sort of fee and vigorously negotiate deal terms. These are the only two techniques that can give a large institution marginally better performance and control over its private equity program. Clearly, the current team at CalPERS has failed to do both. 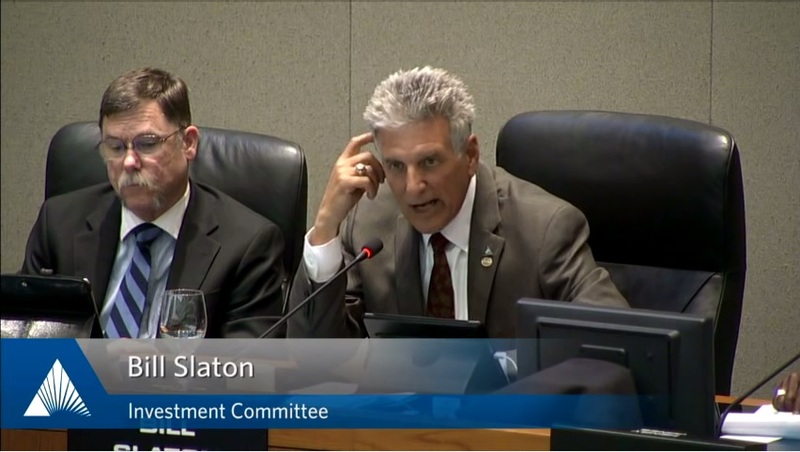 Slaton wraps up by saying he has no intention of doing his job as a board member: “I don’t think we should spend a lot more time trying to find where there’s an error or a problem.” Slaton finishes by plainly stating that he regards the work of supervision and governing as “gotcha” and sees it as beneath him. I trust Governor Jerry Brown is paying attention and finds someone else to install in Slaton’s slot. We see similar undue protectiveness of staff in Henry Jones’ closing remarks. He used the fact that CalPERS has yet to complete its new private equity IT reporting system, PEARS, to justify the inability (and often, refusal) of staff to answer Jelincic’s questions, when he made clear that virtually all of them did not depend on data. Chairman Henry Jones: Okay. I think it’s also important to realize that earlier in the day, Mr. Eliopoulos did indicate an update on the private equity project, the PEARS project, where he indicated that he has collected about 94 percent of the data that’s necessary to maybe answer a whole host of questions that we’ve been asking, and that he plans to come back to the Committee to present that information to us. And so I think it’s important that we know. And matter of fact, he also stated in his comments this morning, that they actually went live and parallel on this particular project that they’re working. So it’s getting there. investment. But I think we need to be patient too to make sure that we get all of the information and get the accurate information, because I think there’s been too many misquotes, too much misinformation that’s been in the public. And as you know, when information is provided to the press, and many times they go with what they were told, and many times it’s not accurate information coming from our Investment Office. So I would encourage us all to be a little patient, and certainly answer J.J.’s questions when the data is available, or if he has specific requests that he can provide that request to you and – so that it can be responded to. Jones’ repeated incantation, “We need to be patient” is mind-boggling. CalPERS has been investing in private equity for 25 years. Staff has, or ought to have, the sort of basic, general information that Jelincic has requested at hand. And notice Jones tried to depict the press as being inaccurate. That’s simply bogus. I challenge Jones to cite a substantive point in which the media has provided faulty information about CalPERS in the recent fee controversy. The proof is that CalPERS does not appear to have asked for, and more importantly, has not gotten, a single retraction. By contrast, as we’ve seen in the last two Investment Committee meetings, CalPERS’ staff has repeatedly told the board things that are flat out wrong or so heavily spun in favor of private equity general partners as to be incorrect. So how, pray tell, can Jones defend staff as the gold standard of accuracy? Jones is effectively telling his fellow board members to regard the staff as the only valid source of information. And if board members don’t consult and cultivate independent channels for news and intelligence, they are guaranteed never to challenge staff. That guaranteed that the board will continue to do a poor job of oversight. CalPERS’ reaction to having its private equity failings exposed has not been to correct these problems, but to attack the people who’ve unearthed them and defend parties who should be held to account. And its board reinforces this pathological response. Sadly, this behavior is guaranteed to produce more self-inflicted wounds and diminish CalPERS as an institution. I got to hand it to Yves Smith, she's been on top of CalPERS and private equity like a fly on manure, but the problem with Yves is she's on some crusade to expose private equity's dirty little secrets and tends to focus exclusively on the negatives, ignoring how important this asset class has been to delusional U.S. public pension funds looking to make their pension rate-of-return fantasy. Don't get me wrong, there are plenty of problems in the private equity industry, many of which I cover on my blog, but if you read the rants on Naked Capitalism, you'd think all these private equity funds are peddling is snake oil and that investors are better off investing in a simple 60:40 stock bond portfolio. This is pure rubbish and spreading such misinformation shows me that Yves Smith doesn't really know much about proper asset allocation between public and private markets for pension funds that have long dated liabilities and a very long investment horizon. 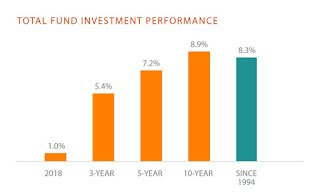 Ask Ontario Teachers', CPPIB, and many other large pension funds the value-added private equity has provided over public market benchmarks over the last ten years (Canadian funds invest and co-invest with private equity funds, reducing fees, and invest in PE directly, foregoing all fees). Having said this, I too watched the CalPERS board meeting and the clips Yves Smith posted, and was surprised at how much stonewalling was going on. To be honest, I felt bad for Christine Gogan as she was clearly used as a scapegoat. Her boss, Réal Desrochers and his boss, Ted Eliopoulos, and Wylie Tollette should have been the people answering all these questions and getting grilled by JJ Jelincic. Now, full disclosure. I used to post my comments on Naked Capitalism and then moved over to posting them on Zero Hedge. I wrote all about it in a 2009 comment on blogging wars and bragging rights. I left both blogs in disgust and let Yves have it for editing my comments and Tyler have it for allowing short-selling gold bug morons to post completely asinine and offensive comments, often attacking me personally but not allowing me to respond with my own comments. Both blogs helped me gain "notoriety" (whatever that means in the blogosphere) so I am grateful to them for that and left their respective blogs on my blog roll (they cut mine out of theirs which shows you how infantile they truly are). I now prefer doing my own thing at the margin and not being affiliated with anyone (I post some of my market comments on Seeking Alpha). Yves' latest comment on CalPERS' capture on private equity is so popular that it got retweeted by Alec Baldwin, a famous actor and potential Democratic candidate. That's all great for Yves as her popular blog is gaining even more popularity but is she being fair in her brutal criticism on CalPERS board, its private equity staff and the private equity industry? I think Yves and her panel of academic experts raise many excellent points but when I read her comment I felt like she was being a bit harsh to some board members and even the staff. In fact, if Yves and her panel of private equity experts are so smart, why aren't they sitting on boards of public pension funds or better yet, running the private equity portfolios at these large public pensions? It's always easy to criticize folks from the outside, especially when you hold a Harvard MBA and think you are god's gift to finance, but what Yves Smith lacks is real-life experience working at a U.S. public pension fund and a bit of humility. Admittedly, I'm not the poster child for humility and have done my fair share of heavy criticism on my blog (read my latest on whether hedge funds are doomed), but I feel like telling Yves and her panel of experts to take a step back and realize who they're directing their criticism to and not to judge them so easily before they understand the constraints they're operating under. Having said this, I watched the investment committee and was also flabbergasted by some of the responses from the board and staff. I know Réal Desrochers and he's no dummy on private equity. 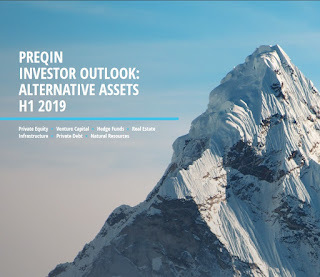 He had a successful track record at CalSTRS and a large sovereign wealth fund before joining CalPERS to take over what most people consider to be a huge private equity mess. 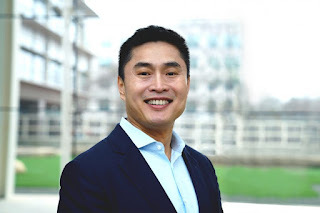 He's spearheading the latest effort to chop external managers by half in an effort to reduce the number of direct private equity relationships and to reduce fees. But the responses to questions board member JJ Jelincic asked were completely unacceptable and a farce. CalPERS' private equity staff should have the answers to these questions on their fingertips and if they don't, they should respond at a subsequent board meeting. If they continue to stonewall, this is a breach of their fiduciary duty and they should be fired. It's that simple. What Yves Smith is exposing here is a fundamental structural flaw with all U.S. public pensions, namely, the lack of proper pension governance. I wrote about it for the New York Times when I discussed the need for independent, qualified board investment boards in a special series debating the public pension problem. 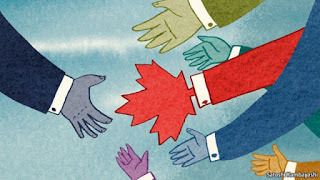 Importantly, until the United States of America follows Canada and introduces meaningful reforms to the way U.S. public pension funds are governed, its public pension system will remain vulnerable to abuse and will eventually succumb from the weight of chronic pension deficits. Sure, some states will fare much better than others but that's not saying much when discussing the pathetic state of state pension funds. What are the key reforms I'm talking about? Have public pensions supervised by independent and qualified board members that are not politically appointed hacks; hire qualified pension fund managers and compensate them properly to manage public and private market assets internally; get rid of the pension rate-of return fantasy that delusional U.S. pensions are still clinging to and last but not least, introduce the shared risk pension plan model at all U.S.public pensions. Getting back to Yves' comment on CalPERS' capture by private equity, one area where I agree with experts is that limited partners need to do a hell of a lot more to tilt the balance of power in their favor. The Institutional Limited Partners Association (ILPA) recently published a press release on its Fee Transparency Initiative, an effort to increase transparency in private equity. The story was picked up by major media outlets and was the focus of Private Equity International’s Friday Letter. The full press release and coverage from some of these outlets are provided on the ILPA's website here. But that's not enough. The ILPA which includes CalPERS, CalSTRS, and many other global pension and sovereign wealth funds needs to use its clout to promote significant changes to the way private equity funds (aka GPs or general partners) carry out their business, including the way they report fees and all other expenses charged to limited partners (LPs). Back in 2004 or 2005, I attended one of these ILPA meetings in Chicago with Derek Murphy, the former head of private equity at PSP Investments. Great for networking and meeting other powerful limited partners but it was a joke in terms hammering out concrete proposals on valuations, fees, and a host of other issues pertaining to improving alignment of interests (I'm being a bit too critical but trust me, I'm not far off). Anyways, I'm tired and have ranted enough on this topic. If my institutional readers, including CalPERS' senior managers, have anything to add, please feel free to email me and I will edit and add your comments here (my email is LKolivakis@gmail.com). 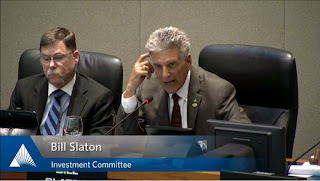 Below, I embedded the second part of the CalPERS Investment Committee from August 17th, 2015 (discussion on PE begins at minute 50 of the clip or watch chopped versions on the Naked Capitalism comment). Take the time to watch this clip as it's an issue pertaining to many other large pension funds that invest in private equity funds. Update: On Wednesday, Yves Smith of Naked Capitalism ended this series with a comment, Why You Should Care About CalPERS’ Staff’s and Board’s Incompetence in Private Equity and What You Can Do About It. I'll let you read her final thoughts which are a rehash of her previous tirades but one thing she misses as she criticizes performance of the CalPERS' private equity program is the benchmark it uses to gauge performance was very difficult to beat. I discussed this issue here.